The LA Art Show has come a long way. Celebrating twenty-four years, this year’s opening gala event takes place Wednesday, January 23, 2019 with the art fair continuing through Sunday, January 27, 2019. Founder Kim Martindale reminisces, “Twenty-four years ago, the LA Art Show only had fourteen galleries at the Pasadena Convention Center – not even in their main hall. Only two hundred and fifty people attended the first year.” The annual art fair now utilizes 200,000 square feet at the LA Convention Center, featuring diverse programming and showcases art from across the globe with 70,000 attendees each year. Once again spotlighting the talents of the Pacific Rim, the LA Art Show welcomes new exhibitors Mizuma Art Gallery and Kamiya Co., LTD of Japan, Galerie Sabine Knust of Germany, and Michael Goedhuis of London. “Michael Goedhuis will be exhibiting the ten leading contemporary ink painters from China, and this is part of a larger feature of ink painting encompassing artists from China, Japan, and South Korea, rarely seen on this scale outside of Asia,” continued Martindale. “Kamiya Co., LTD will even be showing the work of the late Yu-ichi Inoue” (see photo above). Three years ago, the DIVERSEartLA section was introduced and continues under the curatorial eye of Marisa Caichiolo, Director of the Latin American Section of LA Art Show. It was created to showcase museums and nonprofits, as well as performances and installations. This year, DIVERSEartLA will feature programming from Arte Al Límite Collection Chile, CCK – Buenos Aires, Argentina, LACMA, MOOLA, Launch & California African American Museum, Gallery 825, Art Share LA, UCLA and more. Marta Minujín (Buenos Aires, 1943) is a multifaceted artist and a highly emblematic figure of Argentinian art since the 1960s. 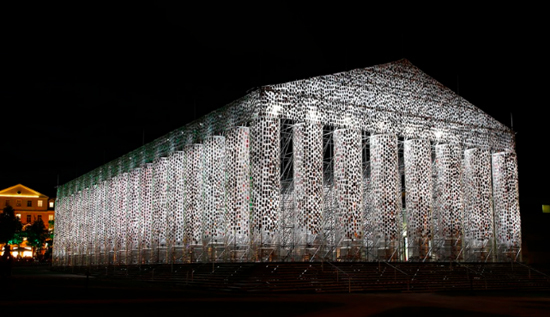 The Parthenon of Books: The Return of Democracy to Argentina in December 1983 was the inspiration that led Marta Minujín to create a replica of the Greek Parthenon on the “9 de Julio Avenue,” a street located in Buenos Aires (Argentina). Many galleries return year after year, such as Santa Monica based bG Gallery, which will feature artists at both the Works on Paper section, but also at its gallery booth located at 701. “I love the diversity and activity of the LA Art Show…the many different art worlds are all spinning simultaneously. It is getting great numbers in recent years, and we are looking forward to showing our artists to the masses,” said Om Bleicher, owner/curator of bG Gallery. This year, bG gallery presents an installation by Mike Stilkey – sculptural painted works on discarded books. The twenty five-foot monumental installation was recently exhibited in Korea after being presented at the World Economic Forum last year. In addition to many other artists, the gallery will spotlight Malibu artist Allois, who recently lost much of her artwork in the recent Woolsey fire. The only four paintings to survive the fire will be exhibited at the bG Gallery booth. Some of her most treasured works including sixty-four original illustrations for The Fall ofHouse of Usher/ Usher II by Edgar Allan Poe and Ray Bradbury, illustrated by Allois (published by Gauntlet Press, 2010), will be gone forever. “We at Gallery Steiner are excited to have Brayden Bugazzi showcasing his art with us at the LA Art Show,” said Deputy Director of the Vienna Austria gallery Dominic Steiner.